"Mr. New Orleans is a rollicking, disturbing ride through the underbelly of a bygone New Orleans, lined with moments of dark, side-splitting hilarity. If you're a fan of James Lee Burke, drop what you're reading and pick this one up. In an era when popular wisdom tells us T.V. has stolen all depth from the literary true-crime narrative, Matthew Randazzo has found a way to beat that trend mightily; he's gone straight to the source and captured the singular, confounding voice of the New Orleans' mafia's top political fixer with fast-paced, riveting prose and a fine journalist's eye for detail." Christopher Rice, New York Times Bestselling author of The Snow Garden and Blind Fall. 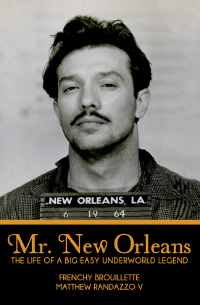 Mr. New Orleans named a New Orleans Times-Picayune "HOT READ". Family, the oldest and most mysterious criminal secret society in America.